Hotel Baía Cascais has 2 bars. 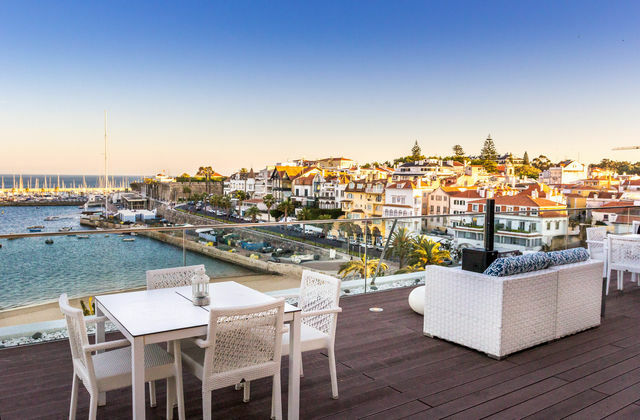 One on the Ground Floor next to its seafront terrace, where you can relax watching the town life or for your 5 o'clock tea with scones, and the Blue Bar on the rooftop terrace overlooking the sea, known for its sunset parties during the summer months. 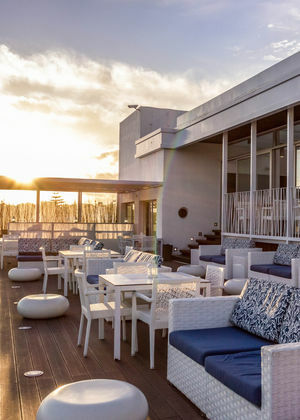 With a breathtaking view, this is the ideal place to relax and try the assortment of cocktails and light meals that the Blue Bar offers. A privileged space, perfect for glamorous seaview sunsets while sipping an exotic cocktail, in a trendy atmosphere provided by the sunlight reflected from the terrace and the soft lighting that diffuses through the screen that rises over the pool. The versatility of Blue Bar Baía also allows for private and corporate events.